Your Ancestor's Military Records Were Destroyed? What to Do? Learn from Experts ›› Military Records ›› Your Ancestor's Military Records Were Destroyed? What to Do? The July 12, 1973 fire at the St. Louis National Personnel Records Center (NPRC) destroyed approximately 80% of Army personnel records from 1 Nov 1912 to 1 Jan 1960; and, 75% of the Air Force records from 25 Sep 1947 to 1 Jan 1964. In all, between 16 to 18 million military service files, including those for WWI and WWII, were destroyed. However, this loss should not discourage researchers from uncovering an ancestor's military experience. With a bit of perseverance and legwork family researchers can rebuild an ancestor's military service history using alternative sources. The result may be confirmation of military service dates, troop activities, discharge data, a list of awards and decorations, and perhaps even a peek at your veteran's medical information. To begin the process of reconstructing your veteran's military experience, first gather vital information, such as birth date and place of birth, as well as death date and social security number (if applicable). Your veteran's unique service number may also be needed. Through the use of ledgers from enlistment stations and service number indexes, the NPRC can usually determine your ancestor's service number. This information will be used to complete the Request Pertaining to Military Records, Standard Form 180 (SF-180) Military Record Requests Using Standard Form 180 (SF-180) . With the help of state and federal agencies, the NPRC has been diligently reconstructing veteran personnel files. Fire damaged records are stored in a climate-controlled area and treated for mold by NPRC preservationists' technicians. It is possible that your veteran's entire service file was salvaged, or has been partially restored or reconstructed. When received, the NPRC will use the SF-180 form to retrieve available documents or may inform the researcher that the veteran's file is in the process of being reconstructed. Upon discharge, each veteran is presented with papers that outline their military service including unit information, rank, dates of service and discharge. These discharge papers, now referred to as Report of Separation (DD214), may list date and place of entry into active duty and home address at time of entry. It provides any battles and campaigns that the veteran participated in, as well as decorations, medals, citations and campaign awards. It also lists service outside Continental US specifying the destination, date of departure and arrival. The reason for separation and the home address after separation is also included. For more information on DD214 reference About Military Service Records and Official Military Personnel Files . Copies of discharge papers were stored in the veteran's personnel file and few were saved after the 1973 fire. 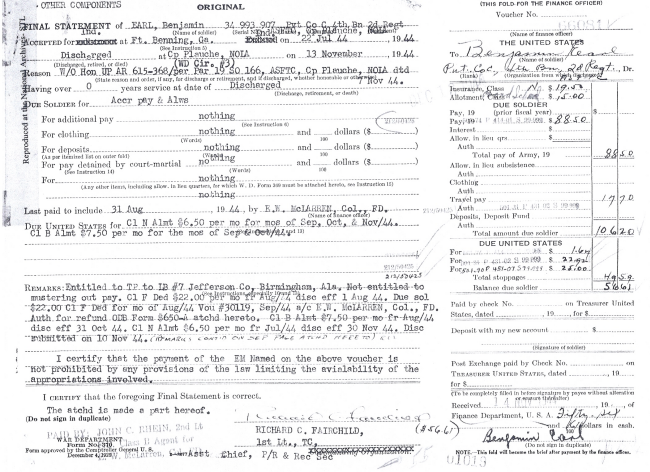 Although it is possible to locate copies of the originals held by employers, funeral homes, or within the Adjutant General records, most likely the researcher will have to use Last Pay Vouchers, Veteran Affairs (VA records), Passport Applications, and naturalization records as alternate sources to finding vital information held on the DD214. Reconstructing this information is the key to rebuilding your ancestor's military service file. A collection of 19 million final pay vouchers is available and may be used as a primary source for reconstructing military service records lost in the 1973 fire. Often the SF-180 response to a researcher's inquiry will verify the existence of a veteran's Last Pay Voucher. If available, the NPRC will provide ordering instructions (usually a fee of $20.00) for the researcher to obtain a pay voucher. Even this lone record can reveal a military footprint of your ancestor's service history. Although this last pay voucher may appear to be a sheet of scribbles and numbers, a keen eye may uncover some interesting hints. If the service number was not known prior, it can usually be found on the voucher. Place and date of enlistment, along with rank, company and regiment may be named. The discharged date and any information where the veteran was stationed will be specified. Itemized payments allocated for overseas service will also be itemized on the final pay voucher. If the veteran received any decorations - medals or ribbons - this too will be listed and replacement medals and ribbons may be ordered. For ordering information visit Military Awards and Decorations. Be sure to note if travel pay was granted. Where the veteran chose to reside upon discharge is normally noted with the travel pay allocation. This information may assist the researcher in locating a copy of the DD214 held at the state's Adjutant General's office. The Adjutant General, appointed by the state Governor (except for Vermont, Washington, D.C., and South Carolina), is the state's senior military officer and "de facto" commander. The Adjutant General's office has historically held military records for the state. Upon discharge, veterans were instructed to register their military service with the local VA offices. This information was filed with the state Adjutant General's office. If the military discharge was registered, the Adjutant General's Office may hold copies of the original separation or DD214 papers. To solicit a copy of your veteran's DD214 from the Adjutant General's Office you may need to submit the SF-180 form. Due to archival space, Adjutant General's archived records, up to WWII, may be held at the State Historical Society or within the State Archives. Many of the veteran service records were on loan to the Department of Veterans Affairs (VA) prior to the fire, leaving them intact. If the veteran or beneficiary filed a claim before July 1973, the VA may have information. If the VA claim was made after 1973, the veteran had to prove military service, so the VA office may already have a partially reconstructed personnel file and may be able to aide the researcher in locating claim files. Recently while searching for a veteran's file, the VA was able to determine which Veteran's Record Center was holding the record I needed. In this case it was the VA Records Center in Dayton, OH. The file revealed an unknown medical condition to the family, plus, a medical discharge letter explaining the "Certificate of Disability for Discharge." Local VA offices may also be of assistance. To verify VA information call toll free number at 1-800-827-1000. In 1988, a collection of computer tapes containing ten million hospital/treatment facility admission records was transferred to the NPRC. To initiate a search of Medical-Related Alternate Records complete Form 13055, Request for Information Needed to Reconstruct Medical Data, PDF here . 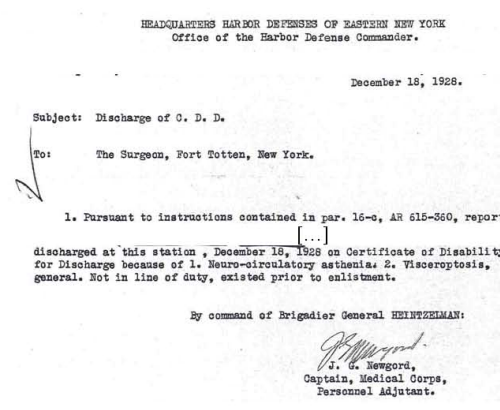 This is the most comprehensive collection to reconstruct military medical records. Funeral records and death certificates should be checked for additional veteran's information. These records may hold copies of separation papers or the DD214. Death certificates may specifically list injuries or illnesses caused during military service. For burial benefits, additional veteran information may even be scribbled in the margin. When reconstructing a veteran's service record, information on troop activities, actions, and daily routines can be helpful. This can be found in daily Morning Reports. Army Morning Reports are available at the NPRC for 1 November 1912 to 1974. Air Force Morning reports are available from September 1947 to June 30, 1966. For detailed information on availability see Morning Reports and Unit Rosters. Morning Reports are available on microfilm and are not indexed by individuals. They list activities such as promotions or demotions, those killed, wounded or missing in action. Service personnel being assigned to a unit, or leaving a unit; and those going to a hospital for treatment are also specified by name. In order to access a Morning Report, the veteran's exact unit of assignment must be known including division/regiment and company name that can be obtained from the Final Pay Voucher, Separation Papers or VA information. Local newspapers clippings may be used to fill in the missing pieces. 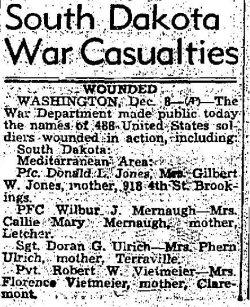 Area newspapers often reported on those wounded during military service. They also may give additional genealogical information (i.e. a parent's name). Be sure to also check with hometown military museums as they often chronicled local veteran's military service. Regiment associations or alumni group records, books, and diaries may provide additional troop activities. These records often list veterans by name. Two resources often forgotten when rebuilding ancestral military service are naturalization and passport applications. Naturalization papers may have military service data, especially if your immigrant ancestor was naturalized while serving in WWI or WWII. While researching a veteran recently, I found extensive military information on a passport application, specifying the veteran's WWI service in France, complete with dates of overseas service and where the veteran was stationed! By compiling the information recorded on Last Pay Vouchers and Adjutant General Records, the researcher will begin to rebuild an ancestor's DD214 data. A thorough analysis of information provided by VA records and death and funeral records, and a bit of midnight oil, will be able to recreate a detailed look into your veterans' service experience. More information can be found on the 1973 NPRC fire at Archives.gov. Additional information on Alternate Record Sources is available at the Archives.gov Alternate Record Sources.